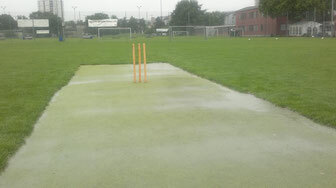 Winterthur's opening game of the season, a friendly against 2014 champions Zurich Nomads Cricket Club, was abandoned after 30 overs due to rain. Nomads were able to complete their 1st innings after Winterthur managed to bowl them out for 264 runs. But before Winterthur were able to begin the second innings the heavens opened and the downpour that pursued ensured that there was no more cricket that day. Winterthur's batsmen will now have to wait until next weekend when the club travels to Lodi, Italy to play two games in two days against our friends Idle Cricket Club.